I absolutely love Christian kids books! I feel like it is an excellent way to expose children to the Lord's love and understanding at a very young age. 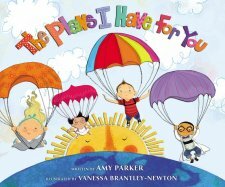 The Plans I Have for You is an encouraging book for little ones that talks about all the things that a child might become and encourages them to follow through and become something fabulous! This book is very colorful, and has a sing-singy flow that works perfect for ages 2-3 to enjoy!